Chirag Parikh & Phil Larson: Earlier this month, we were honored to be invited to the Team America Rocketry Challenge held about 50 miles outside Washington, DC. There, hundreds of middle- and high-school students were participating in a model rocketry competition sponsored by the Aerospace Industries Association. As two guys with aerospace in our blood, we know firsthand the excitement and adrenaline rush of launching model rockets. 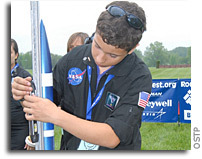 For many youngsters--us among them--model rocketry is a rite of passage that springboards early dreamers to become the engineers and aerospace professionals of tomorrow. They will be the ones designing, building, and operating the next-generation rockets that launch astronauts into space, probes into the farthest reaches of our solar system, and Earth-orbiting satellites that touch every facet of our daily lives. Competitions like the one we attended this month help embed in students the qualities necessary to succeed, such as creative thinking, problem solving, and teamwork. Each three- to 10-person team was challenged to design and build a rocket to climb exactly 750 feet during a 40- to 45-second flight. The payload, a raw egg, had to return to the ground by parachute undamaged. Mapping Dark Matter is a image analysis competition whose aim is to encourage the development of new algorithms that can be applied to challenge of measuring the tiny distortions in galaxy images caused by dark matter. The aim is to measure the shapes of galaxies to reconstruct the gravitational lensing signal in the presence of noise and a known Point Spread Function. The signal is a very small change in the galaxies'ellipticity, an exactly circular galaxy image would be changed into anellipse; however real galaxies are not circular. The challenge is to measure the ellipticity of 100,000 simulated galaxies. The top six teams competing in the first "RealWorld-InWorld NASA Engineering Design Challenge" showcased their creative ideas for a panel of expert judges, fellow teams and others on April 14, 2011. The forum, held in a virtual online space, was the culmination for this year's "RealWorld-InWorld NASA Engineering Design Challenge." The challenge gives high school students a unique opportunity to work with university students to solve authentic NASA-inspired, design-based engineering problems using 21st century technology tools and skills. A short documentary about the PhoneSat suborbital test launch in the Black Rock desert, this video covers both launches of the Nexus One cell phone. 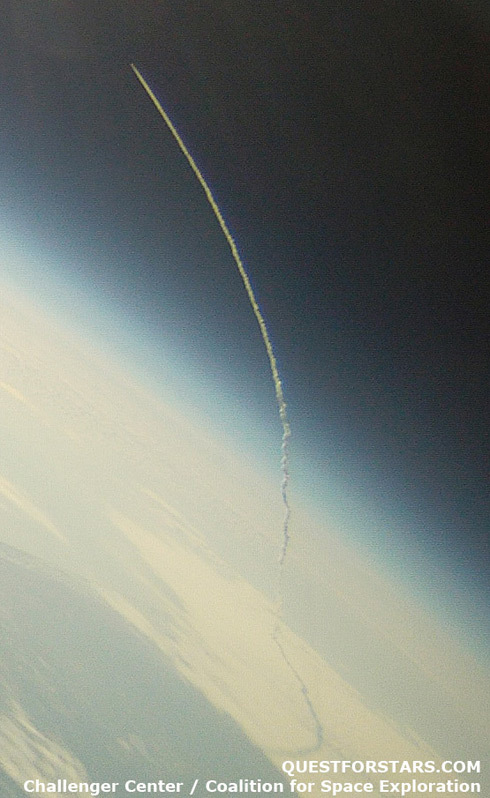 Watch to find out whether they survived their 5-second, 18G trips miles into the atmosphere! More videos. A combined view of ground video, on-rocket video, and accelerometer data from the Nexus One rocket launch. More videos here. "Bring It Back," a small and inexpensive microgravity spaceflight kit, has won the do-it-yourself technology and education space competition sponsored by NASA and MAKE Magazine. 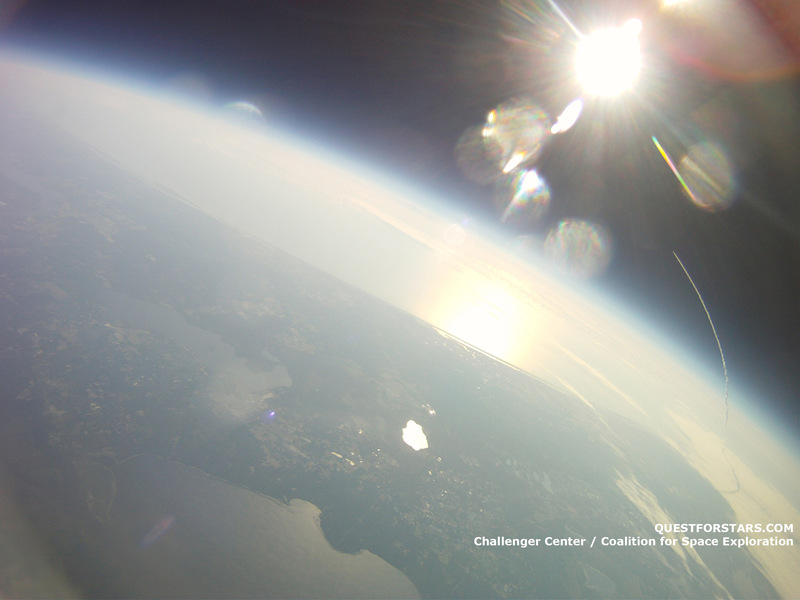 The competition challenged participants to design experiments that could be built for under $200 by high school students to eventually fly on a suborbital flight. In addition to being low cost, the winning entry also had to illustrate sound science, technology, engineering and math (STEM) principles. The competition was designed to inspire curiosity and create interest in STEM among classroom teachers and students. 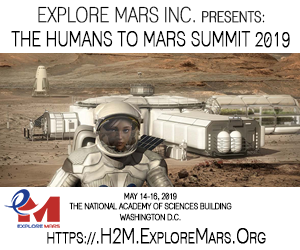 DARPA is seeking ideas for an organization, business model and approach appropriate for a self-sustaining investment vehicle in support of the 100 Year StarshipTM Study. 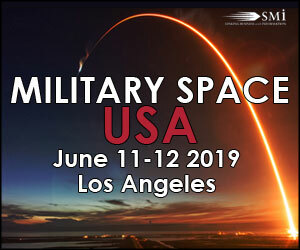 The 100 Year StarshipTM Study is a project seeded by DARPA to develop a viable and sustainable model for persistent, long-term, private-sector investment into the myriad of disciplines needed to make long-distance space travel practicable and feasible. 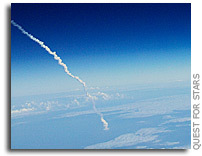 The genesis of this study is to foster a rebirth of a sense of wonder among students, academia, industry, researchers and the general population to consider "why not" and to encourage them to tackle whole new classes of research and development related to all the issues surrounding long duration, long distance spaceflight. 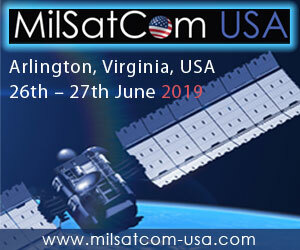 DARPA contends that the useful, unanticipated consequences of such research will have benefit to the Department of Defense and to NASA, and well as the private and commercial sector. In fall 2011, NASA's Gravity Recovery and Interior Laboratory, or GRAIL, mission is scheduled to launch twin spacecraft in tandem low-altitude orbits around the moon. The spacecraft will measure the moon's gravity in unprecedented detail. The mission will answer key questions about the moon's internal structure and give scientists a better understanding of how our solar system formed. The satellites will carry special cameras, dubbed MoonKam, which stands for Moon Knowledge Acquired by Middle school students. During the science phase of the mission, students will send in requests for the cameras to take photos of specific areas on the lunar surface. The images will be posted on the Internet, and students can refer to them as they study highlands, maria and other features of the moon's topography. Environmental Tectonics Corporation announces the formation of the NASTAR Foundation, a non-profit organization that fosters opportunities for people of all ages to experience the excitement of aerospace exploration. 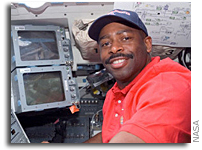 Pro-football-player-turned-multi-mission-astronaut (an all-around Superman), Leland D. Melvin will meet and talk with museum-mentored high school students in a computer-generated, 3-D environment created by students on the Miami Science Museum's virtual world island in Second Life on Saturday, May 21st at 10 a.m. Using avatars that they have created, youth will interact with Mr. Melvin's avatar, who will talk about his passion for science, lend insight into his career path, and answer students' questions. ROSES-11 Amendment 9: New proposal opportunities for Earth and space science experiments using short duration orbital platforms including CubeSats. Short duration orbital platforms, such as CubeSats, may offer new capabilities for the conduct of NASA scientific research, education, and technology advancement. NASA has commenced a CubeSat Launch Initiative and begun regularly providing launch opportunities for CubeSats as secondary payloads on NASA launch vehicles. Images were taken at approximately 64,000 ft. More to follow. More information at Questforstars.com. Additional photos are online here at Twitpic. Airlines can not afford to fly with empty seats very often - and Space Shuttle orbiters can't leave valuable payload capacity "on the ground." Costing hundreds of millions of dollars per flight, NASA filled extra space in the shuttle's cargo bay using the Shuttle Small Payloads Project (SSPP). Hooks and power buses built into the shuttle bays allowed hundreds of small, modular experiments and technology test units to make the best use of missions that didn't need all 50,000 pounds of payload capacity. 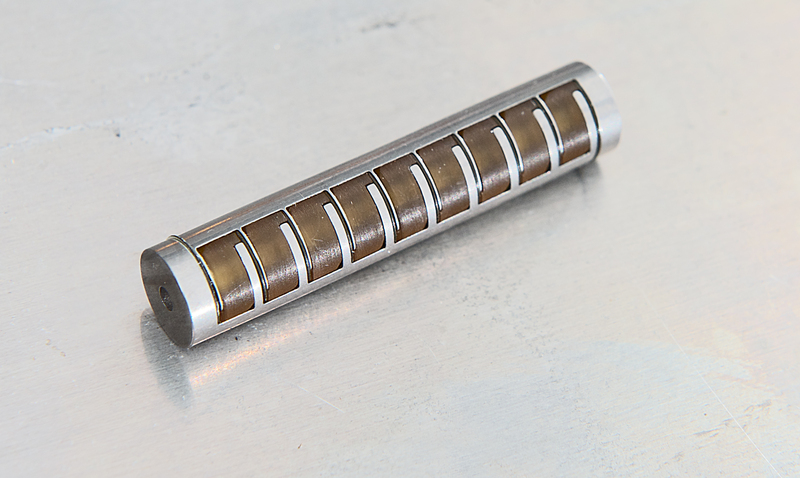 Between 1982 and 2003, more than 200 of these projects, including Get-Away Special (GAS) Cannisters, Hitchhikers and Spartans, flew in 108 missions. The X PRIZE Foundation and the LEGO Group today announced MoonBots 2.0: A Google Lunar X PRIZE LEGO(R) MINDSTORMS(R) Challenge. This second annual contest will challenge teams of youth to design, program, and construct robots that perform simulated lunar missions similar to those required to win the $30 million Google Lunar X PRIZE, a private race to the Moon designed to enable commercial exploration of space while engaging the global public. To further this purpose, the X PRIZE Foundation and the LEGO Group have partnered with WIRED magazine and FIRST robotics to offer a competition that will excite students and their families about the Moon, robotics,and team building. 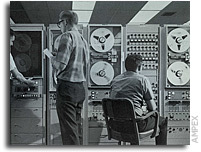 April 1967: "Fifty Years of Data in One Week: Recently, Oran W. Nicks, NASA's Director of Lunar and Planetary Programs, remarked: "one astronomer has said that more information has been obtained in the first seven days of the Lunar Orbiter I project than in the last 50 years of study of the Moon." Truly, the matchless cooperation and inspired creativity exhibited in the design and construction of Lunar Orbiter spacecraft and, supporting equipment by NASA, the scientific community, and American industry has helped us to take those longer-strides that President Kennedy called for in 1961 when he first spoke of the Apollo landing of a man on the Moon and returning him safely to the earth." Are you ready for zero gravity robotics? Innovate Our World, a Maryland educational nonprofit, has partnered with a leading Google Lunar X prize competitor, Astrobotic Technology of Pittsburgh, PA, to help student teams from two central Maryland high schools design payload concepts suitable for Astrobotic's planned 2013 Tranquility Trek mission to the Apollo 11 landing site. Using information about the lunar environment, previous missions to the Moon, basics of conceptual payload design, and local experts, students from Glenelg Country School in Ellicott City, Maryland and Oakland Mills High School in Columbia, Maryland proposed and designed two lunar payloads and will present their concepts to Astrobotic Technology on Saturday, May 21, 2011 at 1 p.m.